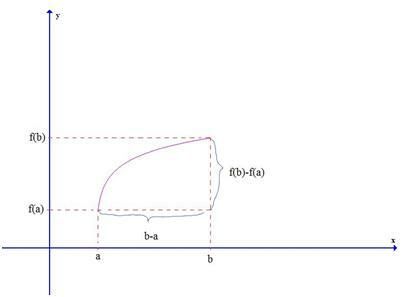 The mean value theorem is one of the "big" theorems in calculus. In this page I'll try to give you the intuition and we'll try to prove it using a very simple method. This theorem is very simple and intuitive, yet it can be mindblowing. Suppose you're riding your new Ferrari and I'm a traffic officer. I suspect you may be abusing your car's power just a little bit. I know you're going to cross a bridge, where the speed limit is 80km/h (about 50 mph). So, I just install two radars, one at the start and the other at the end. The first one will start a chronometer, and the second one will stop it. Total crossing time: 8 seconds. "At some instant you where actually travelling at the average speed of 90km/h". 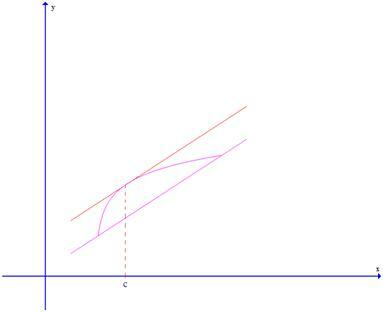 The expression is the slope of the line crossing the two endpoints of our function. 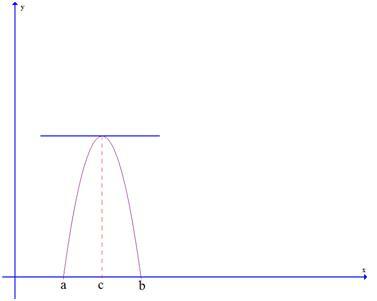 If the function represented speed, we would have average speed: change of distance over change in time. The derivative f'(c) would be the instantaneous speed. There is also a geometric interpretation of this theorem. 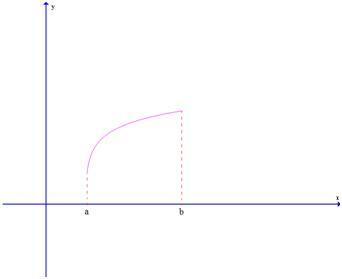 We just need to remind ourselves what is the derivative, geometrically: the slope of the tangent line at that point. The proof of the mean value theorem is very simple and intuitive. We just need our intuition and a little of algebra. To prove it, we'll use a new theorem of its own: Rolle's Theorem. Given a function that looks like that, there is a point c, such that the derivative is zero at that point. That implies that the tangent line at that point is horizontal. Why? Because the derivative is the slope of the tangent line. Slope zero implies horizontal line. If M = m, we'll have that the function is constant, because f(x) = M = m. So, f'(x) = 0 for all x. And we not only have one point "c", but infinite points where the derivative is zero. If M = f(a), we also know that f(a)=f(b), so, that means that f(b)=M also. That in turn implies that the minimum m must be reached in a point between a and b, because it can't occur neither in a or b. If M is distinct from f(a), we also have that M is distinct from f(b), so, the maximum must be reached in a point between a and b. And as we already know, in the point where a maximum or minimum ocurs, the derivative is zero. And that proves the Mean Value Theorem.